This costume debuted at Hypericon 2008. It won best in show in their Masquerade. Inspired by the game, (which I only played for a couple of days before I got very bored of the repetition of climb on the roof, jump, kill someone… but that’s another story), we didn’t get into much of the detail of the weapons, but focused just on the basic components. These are the components that Laura made for me. 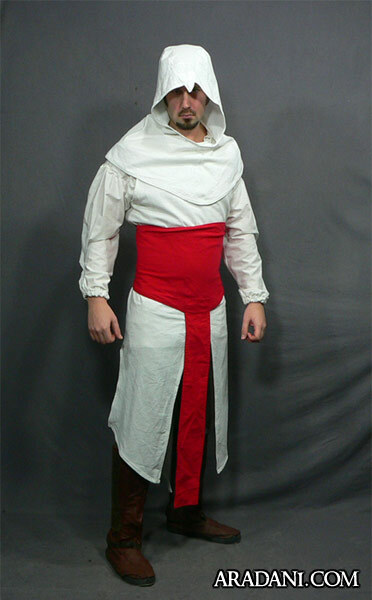 Hood and over tunic are made of linen, and the sash is made of a red linen to match. It has a good feel to it, it drapes right and has enough weight to not look cheap, but still is not stiff so it flows correctly. Our Deluxe version, which includes the waist belt and the shoulder harness. 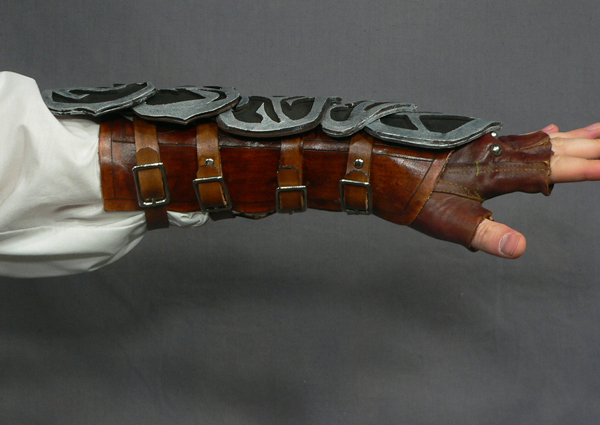 My full version, with leather bracers. All leatherwork was made by me. 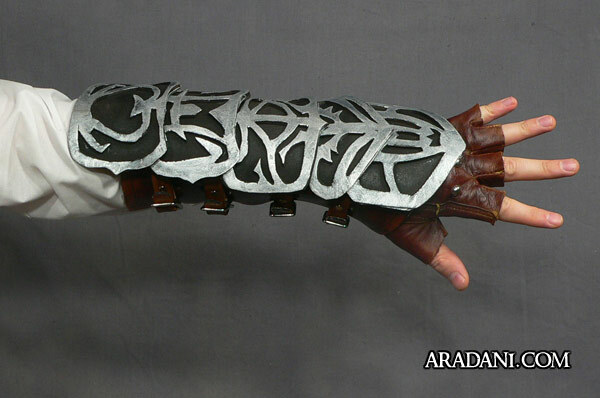 The bracers are a base leather, and for the decorative left bracer I used foam and painted it with acrylic. 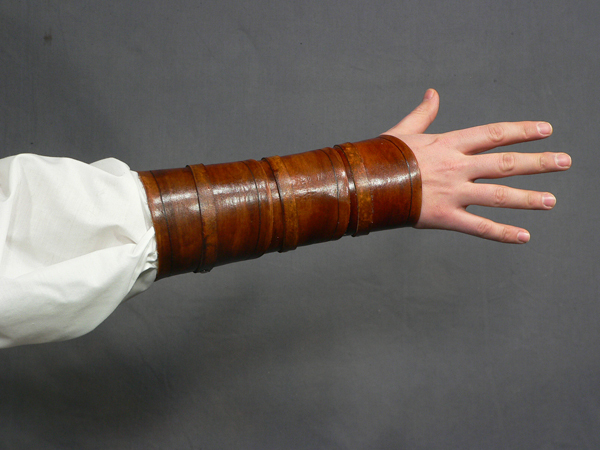 The leather glove was actually a work glove that I re-dyed and sewed to make it fit a little tighter. 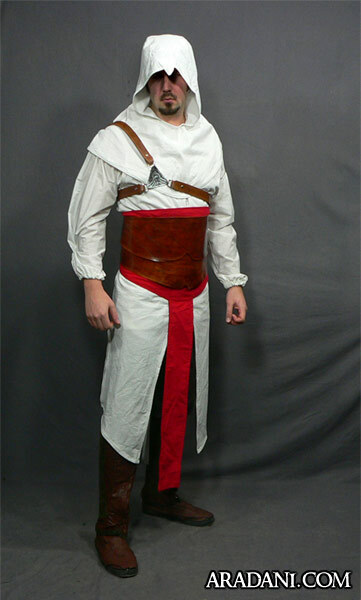 One of the problems making a costume from a video game is that real fabric moves so much differently than the stuff in the games. But I do feel Laura did a great job at making it look just right! 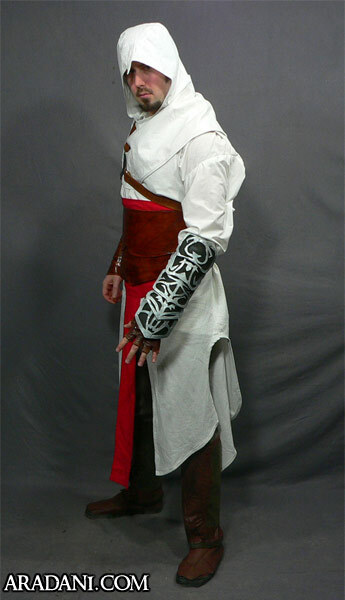 Altaïr is an ancestor (on his mother’s side) of Desmond Miles, a modern-day assassin. He killed his mentor, whom he called his second father, Al Mualim in September 1191 in Masyaf, after discovering his betrayal. Using the Apple of Eden he seemed to know the future, as he uses a small firearm to kill Abbas Sofian in 1247, long before guns were invented. 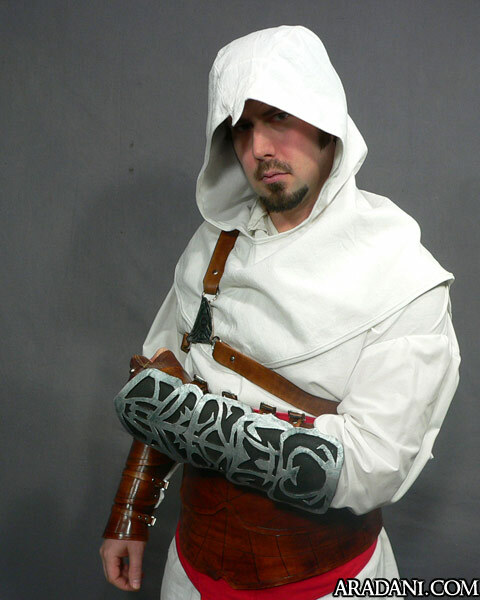 He lived from 1165 to 1257, and his remains were found in the Masyaf castle library by the Florentine Assassin Ezio Auditore da Firenze in 1512. 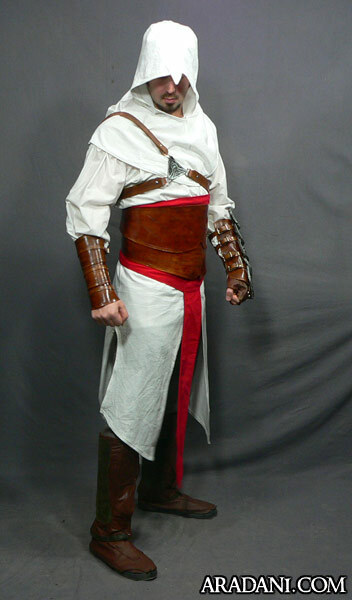 Though his face can be somewhat seen in the original Assassin’s Creed, it is fully revealed in Assassin’s Creed: Revelations when he is older.